A big portion of the 70/30 Plan is making sure that you have good quality foods on hand at all time. We seem to make our worst food decisions when we are tired, hungry and want something to eat immediately which is why having nutrient-dense foods readily available helps ensure you're eating healthier a majority of the time. One thing I recommend on the 70/30 Plan is to pick a day out of the week where you have a little free time to dedicate to meal planning and meal prepping; essentially preparing a few food items in advance for the week ahead. This salad is perfect to meal prep as it holds up nicely throughout the week and also travels well for a to-go lunch. Plus, it works great with any protein as a side or tossed in with extra mixed greens to spice up your salad! Click here for more 70/30 Plan recipe inspiration. Quinoa is an excellent source of vitamins, minerals and even protein! It is also healthy for the gut as it helps feed the gut with nutrients in order for bacteria to thrive. In fact, our gut health relies on the fact that we consume a very diverse diet in fresh fruits, vegetables, sustainable meats, healthy fats, vitamins, minerals and fiber. Quinoa and other healthy grains are wonderful in helping maintain optimal gut health. You can also substitute quinoa for other sprouted grains as well! I used arugula and basil in this salad but you can also use any greens of choice like kale or spinach plus cilantro or parsley. You can also change up the fix-ins like adding various dried fruit and nuts like slivered almonds, pecans, raisins and sliced apricots. I also used a balsamic glaze just for a little added taste but be cautious and use sparingly as it tends to have more sugar; if used in moderation it is a nice addition to the salad. I also topped it with goats milk feta as goats milk often times is easier to tolerate than regular dairy and I also love the taste! Regular feta works great as well or feel free to omit all together. I hope you enjoy this recipe and have fun with the variations of ingredients! Cook quinoa according to directions on package, allow to cool completely. 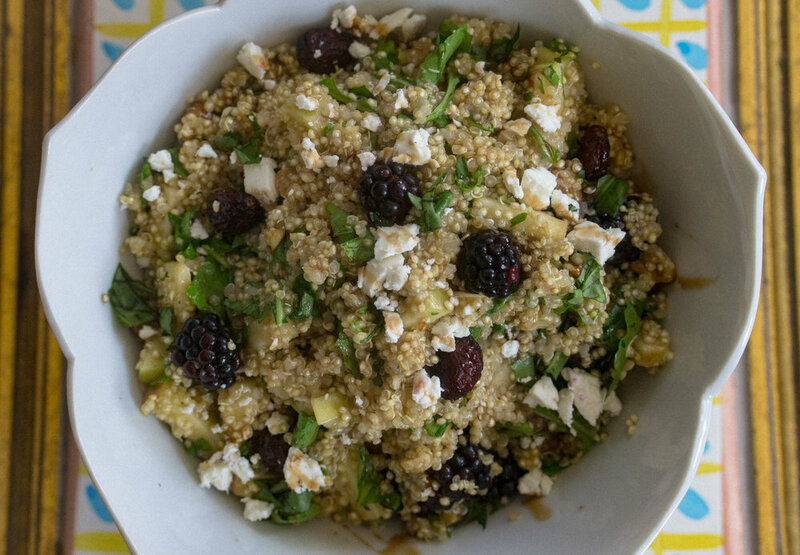 Add quinoa to bowl and combine with other ingredients. Add in sea salt and oil then combine well.